In the beginning the cakes were, shall we say, rough around the edges. As time has gone on I have felt the need to go a bit further in terms of creativity. So when Owen said “wing it” I tried to do exactly that with a nature theme. Owen just happened to be born on Easter morning and each year he enjoys Easter a bit more than his siblings, even when Easter falls a couple of weeks from his actual birthday. 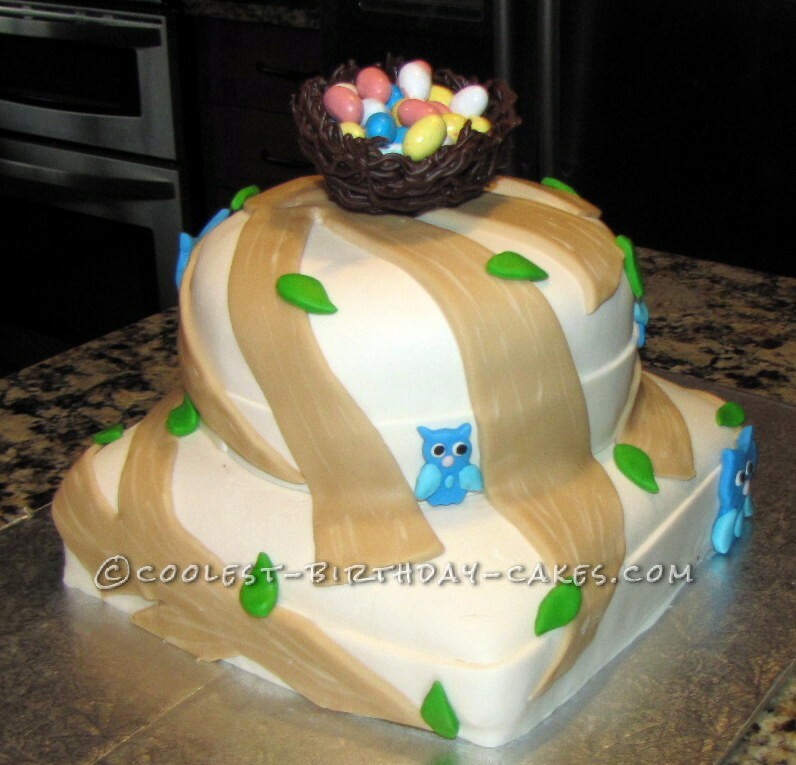 This cake incorporated nature, “winging it” and Easter. 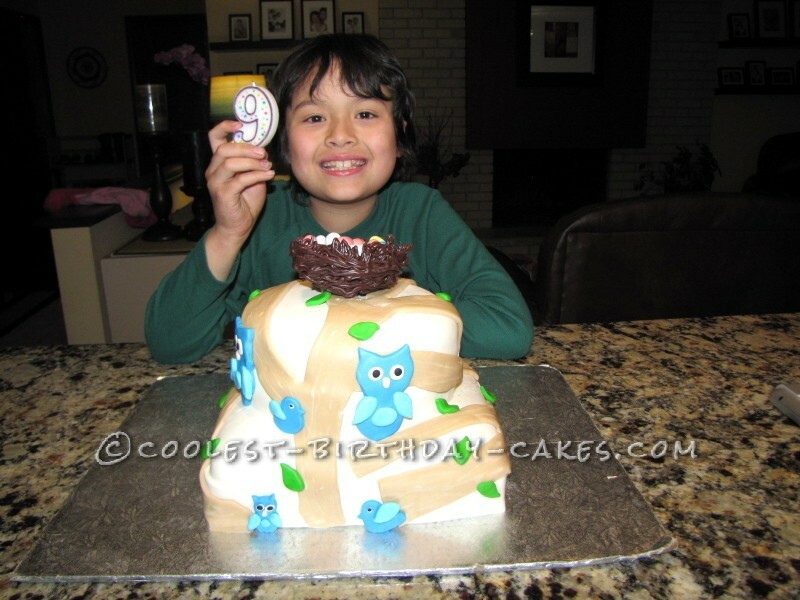 Another challenge was the chocolate nest on top of the cake. I had to find a way to make a round nest that wasn’t too big for the top tier.I tried and retried and re-melted the chocolate about a million times before finding the perfect sized cup to use as a mold for the nest. The most fun part of this cake was designing the trees. It was all free-hand cutting and then scoring the trunk. It felt whimsical to make and I didn’t feel like I could “mess” it up. 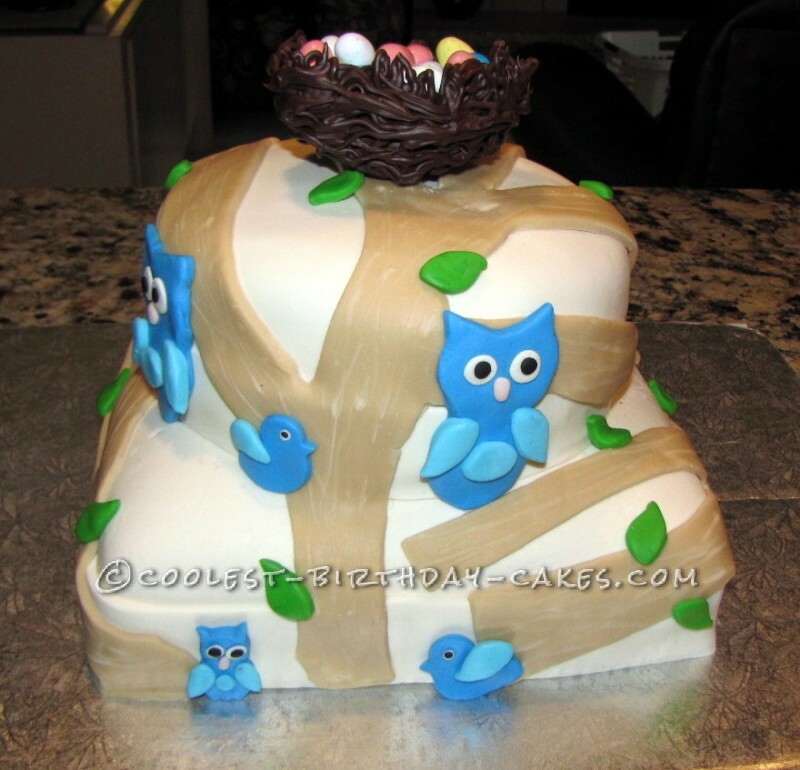 When I made this cake owls weren’t quite as popular as they seem to be now. Owls are very peaceful creatures and they have a loving feeling to them, perhaps going back to my Winnie-the-Pooh days. They remind me of wise and inquisitive children, like my own. 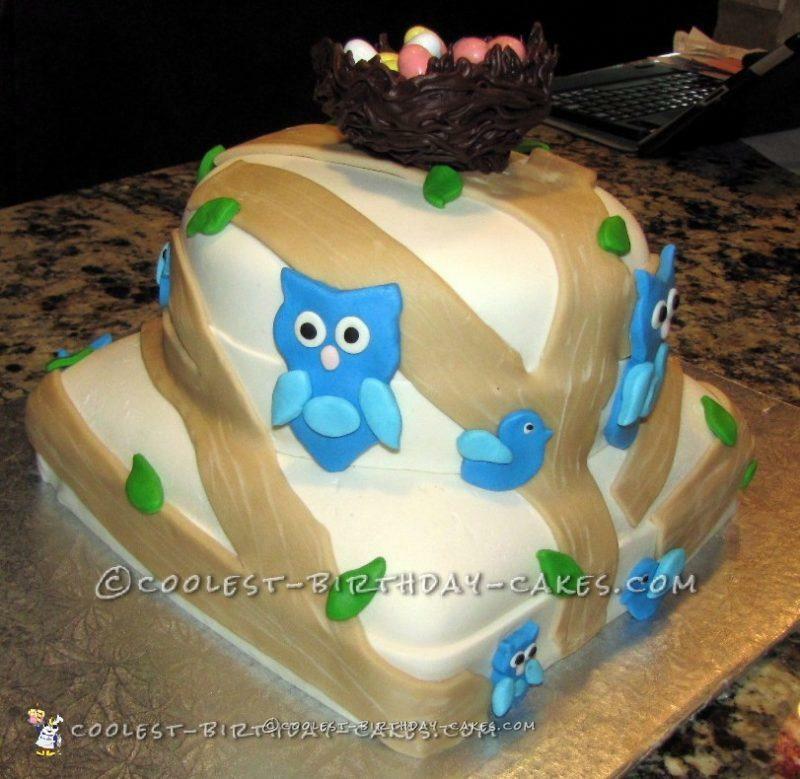 Most of all, I love all the birds on this cake. Their wings! Giving your children wings to fly and be independent. They eventually come back to the nest. I didn’t know what a nature cake looked like in my son’s imagination, but the look on his face when he saw it was priceless! 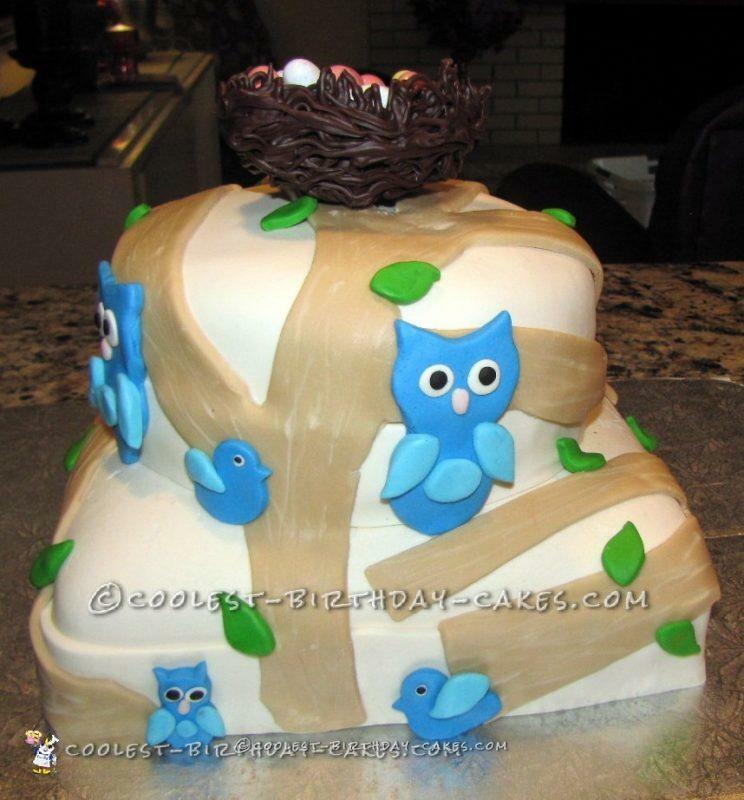 Perhaps I’ll have to “wing it” with more cakes in the future.